Question: Is there a good way to collect maidenhair spores? would they grow, if dropped over moss in a terrarium? Answer: I would have to say 'yes' and 'no' to this question. I have collected maidenhair spores by saving the fronds that have the dark colored spores on the underside. To test the viability I sprinkled them over damp dirt in a tray and put a lid on it and a few did grow. They are very delicate translucent little fiddleheads and a lot of fun to watch "sprout." When the spores grew in the tray I did try dropping some into a bottle terrarium and one grew. 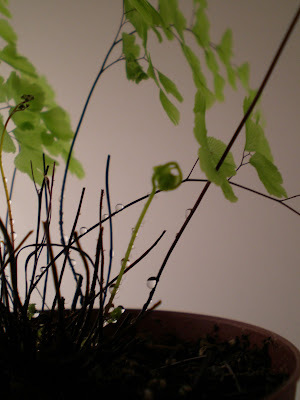 However the baby adiantum pedatum are extremely fragile and dislike being moved. I eventually killed it by moving other stuff in the terrarium around the baby maidenhair and upsetting it too much. If you are interested in growing adiantum pedatum in a small space there is one other option I have discovered that seems more reliable than sprouting the spores. You can cut a small section (maybe .5"x.5") of the matted roots and stems that make up the base of maidenhair clusters and plant this in the soil. These root clusters are extremely durable and will almost always sprout fronds given enough moisture. Granted I have never had much luck keeping mature maidenhair ferns alive in my terrariums or in my room or in my yard. I see them in the wild in Santa Barbara all the time but I can't seem to keep them healthy for long. I think the adiantum pedatum ferns require more air movement than is provided in bottle terrariums. You are so right, they do need air movement. I have studied them for the last 3 years, when I had a maiden hair fern it did great on a humidity tray with a small fan circulating above it, then I tried it without the fan and it died later on, go figure! now I have to find another fern. I agree with Cathy. I love this ferm but it is tricky as to moisture and (for me anyway) light. Thanks for your comments Tina. I'm so glad to hear you enjoy being outdoors with your granddaughter and making terrariums. They can be difficult once mold sets in. It might be best to try a new one!